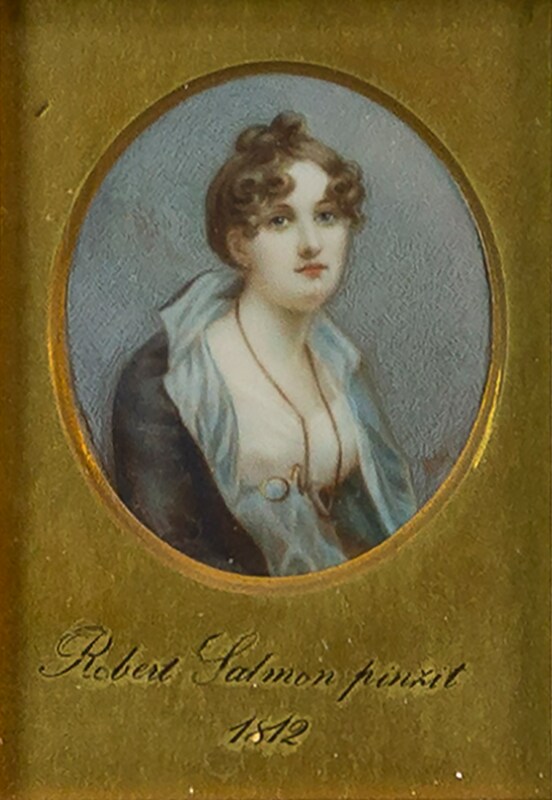 Lot 496 in the Paintings, Drawings & Prints Online Auction is a beautiful portrait miniature by English maritime artist, Robert Salmon (1775–1845). Born in Cumberland in 1775, Salmon gained his early training through copying Dutch and Flemish painting. He found his niche in maritime scenes, capturing the ships in Liverpool, Greenock, Southampton and North Shields, before relocating to America in 1828. His devotion to maritime painting saw him become one of the leading painters of the genre, but lot 496 shows he was also talented miniaturist. Dated 1812, this piece was painted the year he moved to Greenock where he stayed for nine years before relocating back to England. Nothing is known of the sitter, but it is certainly possible she was Scottish and maybe even from Greenock. She is also styled in contemporary fashionable dress, sporting an Empire waist which was typical of the early Regency period. Miniatures are the most intimate and charming forms of the portrait genre – they functioned as a token of respect, affection and remembrance and are deeply emotional and personal pieces. They were typically mounted as jewellery, but as can be seen with this example they were also framed and hung on the wall as works of art in their own right. Portraits by Salmon are very rare and only one has ever appeared at auction. Painted “on spec” in 1828, Portrait of Paul Gnomes (Believed to be John Paul Jones) is believed to be his only extant portrait, so lot 496 presents a wonderful opportunity to own a rare and fine example of Salmon’s output. This lot carries an auction estimate of £350–550. The auction runs until Sunday 28 October. The Paintings, Drawings & Prints Online Auction takes place every six weeks. Come along to the Valuation Days at McTear’s on Tuesday, Wednesday and Thursday this week for complimentary auction advice.